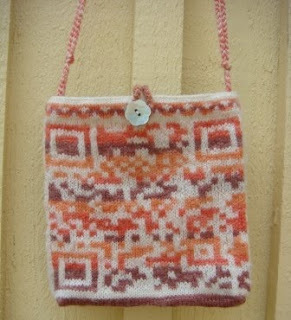 QR Code knitted glove and bag idea. 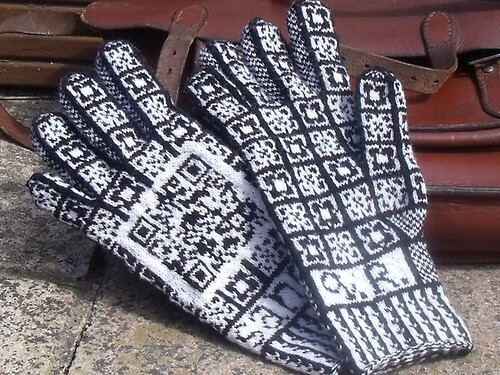 Knit a QR code glove. QR codes are printed on many things today. You can scan them (take photo) with your cellphone camera and will send you to webpages to get information about a certain topic. I’m just wondering if you scan the glove if it would really work? More info here and here. QR-codes are two-dimensional bar codes – matrix codes – and were created in Japan in1994. The creator intended the code to allow its contents to be decoded at high speed. QR Codes storing addresses and URLs may appear in magazines, on signs, buses, business cards, or just about any object that users might need information about. Users with a camera phone equipped with the correct reader, app, can scan the image of the QR Code causing the phone’s browser to launch and redirect to the programmed URL.